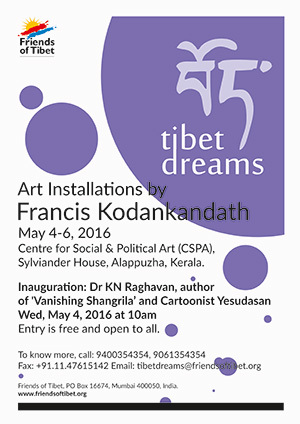 Alappuzha, Kerala: The second edition of "Tibet Dreams" — a travelling art exhibition by Contemporary Indian Artist Francis Kodankandath was held at Centre for Social and Political Arts (CSPA), Alappuzha from May 4-6, 2016. The exhibition supported by Friends of Tibet was a set of painted ethnic daily wear from Tibetan people. Artist Kodankandath a customs official by profession but an artist by passion. His paintings of Krishna and the demystified Last Supper has changed several understandings on contemporary art. Kodankandath has a long association with the Tibetan culture and the cause. 'Tibet Dreams' exhibition is the recent expression of the same. Tibet Dreams is a collection of used traditional Tibetan clothes representing the three regions of Tibet — Amdo, Kham and Ü-Tsang. Kodankandath on asking about it had told that he wanted to portray the day to day angst of the Tibetan public. These cloths with the sweat of the Tibetans represents their day to day struggle inside Chinese infested Tibet and in. These costumes are painted with pictures and motifs of Tibetan life. The art exhibition started its pan India journey Jahangir Art Gallery, Mumbai. The exhibition at Mumbai was inaugurated by noted industrialist Vijay Crishna and Smita Godrej. The exhibition at Alappuzha was inaugurated by Dr KN Raghavan IRS, Commissioner of Customs, Kochi and noted political cartoonist Yesudasan. 1) Inaugural Speech by Dr KN Raghavan IRS, Commissioner of Customs, Kochi and author of 'Vanishing Shangri La: History of Tibet and Dalai Lamas in 20th Century'. 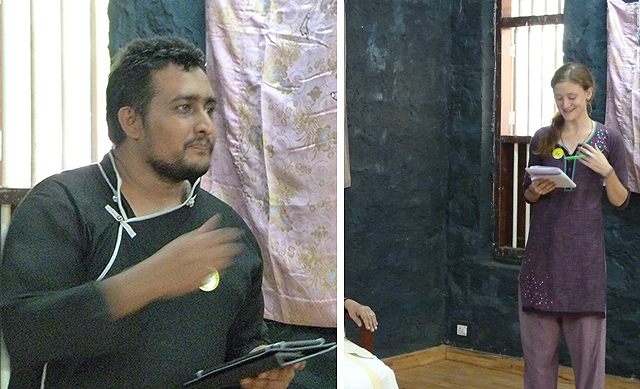 2) Artist Francis Kodankandath speaks during the inaugural session of the second edition of "Tibet Dreams" at Centre for Social and Political Art (CSPA), Alappuzha on May 4, 2016. Dr Dorjee Rapten Neshar, Dr KN Raghavan, Cartoonist Yesudasan next to him. Dr Raghavan, a researcher on the Tibet 1962 Indo-China war has also authored the book — 'Vanishing Shangri La: History of Tibet and Dalai Lamas in 20th Century,' portraying the agonies of Tibetans as well as highlighting the Tibetan cause to the World. Dr Raghavan said he was overwhelmed by the solemnity of the occasion - lighting the butter lamp, chanting the universal peace prayer song which he felt gave a glimpse of what Tibetan. He talked about the two unfortunate events that happened in the 20th century that changed Tibet and Tibetans forever — the first one being they becoming part of a conspiracy staged as part of the territorial expansion of the British Empire, the Younghusband expedition, reaching up to Lhasa and creating havoc there. After that things quietened down when in the 1950s the whole world changed for them, after Communists came to power in Beijing and decided to 'liberate' Tibet, liberate from whom is a big question? But they did succeed in throwing out an established order and setting of the new order. Tibetans did try their best to live under the new regime, but unfortunately it wasn't successful and in 1959 the world witnessed how the Dalai Lama escaped and came to India. Dr Raghavan cited that ever since then there were two Tibet, the physical Tibet located as a part of what they call the TAR, and the adjoining provinces of People's Republic of China and the Human Tibet which is spread all over the world, mostly in India where they have made their own home outside their home. Dr Raghavan shared how he had the opportunity of going through some of the historical aspects during his visit to Dharamshala and the experience was a fascinating one, but a person there corrected him, "you do not know the sorrows of a person who is forced to leave home and is living in exile, always wanting to go back home." The home was somewhere in the Himalayas with lot of snow and mountains blended with nature but now is inhabited by outsiders." Dr Raghavan cited that the Tibetans are a minority in their own place and are now forced to live in tropical climate facing savage heat, mosquito bites, but they have a strong heart and determination to survival. 1) Sylvie Bantle, noted German writer and theatre performer welcomes the gathering. 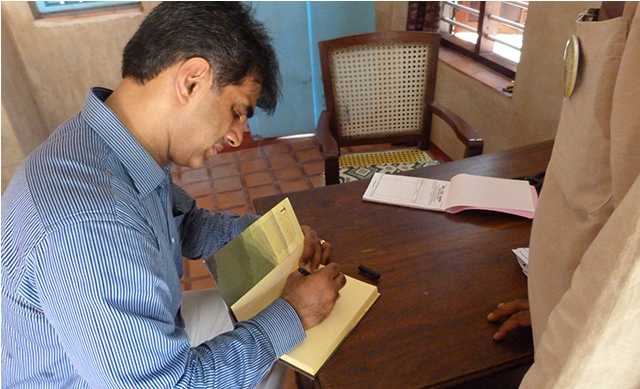 2) Dr KN Raghavan releases the book 'Resistance in Exile: A Study of Tibetan Poetry in English' written by Dr Appu Jacob John by giving a copy to Cartoonist Yesudasan. Dr Raghavan emphasised that today Tibet is something that the People’s Republic of China want the world to forget and they are being quite insistent about that. Even countries like South Africa, which was forced to deny visa to His Holiness and Norway, historically portraying themselves as a politically tolerant nation, were forced to deny its government officials meeting HH the Dalai Lama. Dr Raghavan shared the incident wherein Norwegian Prime Minister was candid and honest enough to say that they do not want to get into problems with the Chinese. Dr Raghavan opined that it was indeed a great source of happiness that a small group of people, Friends of Tibet, is able to take lead to help out and make people understand the life and culture of Tibetans. Dr Raghavan further stated that he felt honoured to be a part of such a group which was doing great work on behalf of the community which has been living in this country for over half century. He stressed that the Tibetan cause is a noble cause and how he honestly hope and feel that no power on earth can deny for long, the aspiration of people to be Independent. He cited how history teaches us that the dictators and strong rulers are forced to succumb at some time or the other to popular will. He stressed there lies the future of Tibet. "Their dark days, the winter that they see today will definitely give way to spring of happiness and sooner than later they will find their way back to their home land. The civilisation that they have restored outside can then be safely taken back to the homeland." Dr Raghavan congratulated his colleague and friend, artist Francis Kodankandath on taking up the cause and for coming out with a magnificent work 'Tibet Dreams'. He was optimistic that the exhibition will receive applause as it travels round the country. He also thanked Friends of Tibet for inviting him and wished the artist, the organisation and the cause all success. "Don’t think the World is not with you it will certainly be with you", he reminded the gathering. Noted political cartoonist, Yesudasan congratulated the artist for embarking on such a mission. 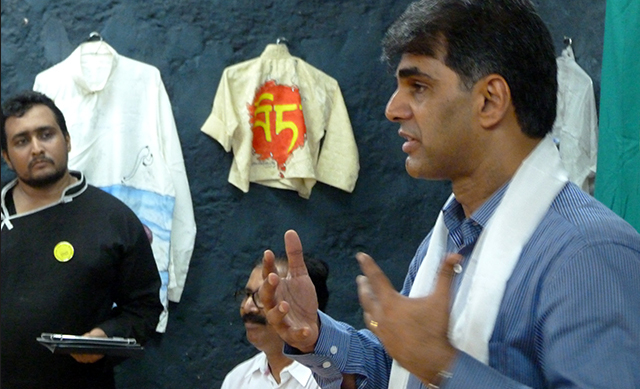 He shared with the audience his long association with Kodankandath and the Tibetan cause. The inaugural function also witnessed the release of "Resistance in Exile: A Study of Tibetan Poetry" in English by Dr Appu Jacob John. Dr John is a Professor in English and a long term associate of the Friends of Tibet. This book is a report of his research on the various facets of Tibetan poetry in English. 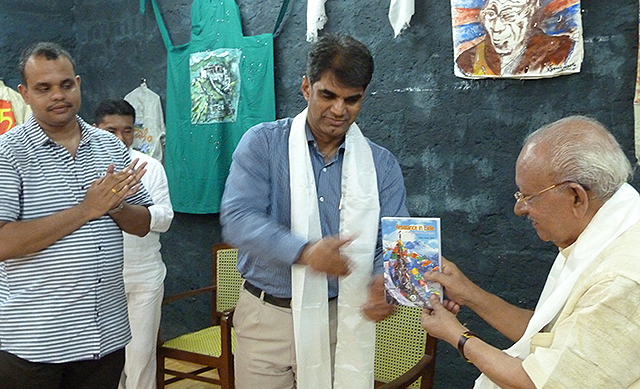 Dr Dorjee Rapten Neshar, Chief Medical Officer, Men-Tsee-Khang, Bangalore introduced the book and the author Dr Raghavan released the book by handing over the first copy to cartoonist Yesudasan. The inaugural function started with the chanting of the Universal Peace Prayer by Men-Tsee-Khang medical team from Bangalore. Dr Dorjee Rapten Neshar, Chief Medical Officer, Men-Tsee-Khang, informed the gathering the importance of the Universal Peace Prayer which was composed by His Holiness the XIV Dalai Lama. Eswar Anandan, poet and Friends of Tibet Campaigner recited the poem "Tibet Dreams" dedicated to the travelling exhibition. 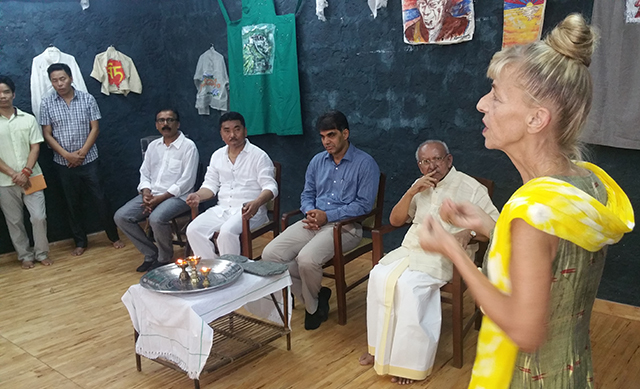 The gathering was welcomed by Sylvie Bantle, noted German writer and theatre performer. Victoria Sheldon, Canadian research scholar and also a Volunteer of the Wellbeing initiative of Friends of Tibet, proposed the vote of thanks. 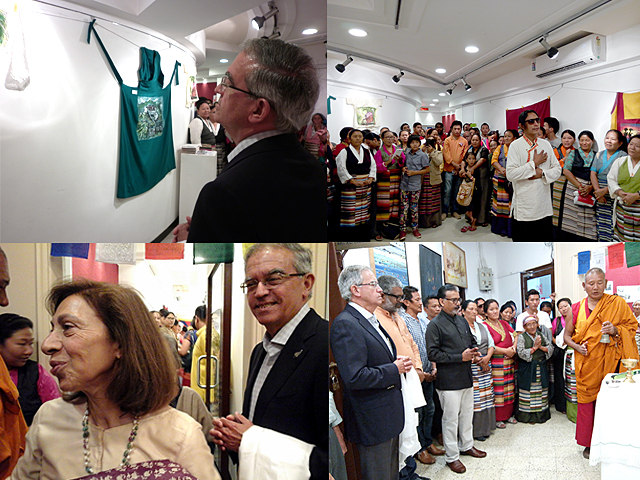 "Tibet Dreams" was well attended by people from various walks of life who came from the length and breadth of the country. The exhibition was a unique experience for the general public and art lovers. 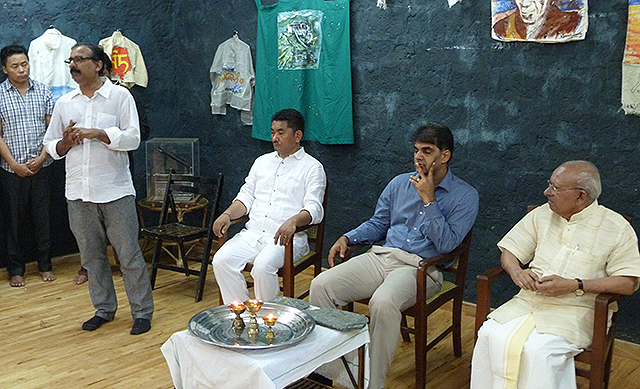 Vijay Crishna, noted Industrialist and theatre personality and Smita Godrej inaugurate "Tibet Dreams" art installation exhibition of Francis Kodankandath at Jahangir Art Gallery, Mumbai on January 11, 2016.